The blast of a trumpet and gunfire roused Mrs. Henderson’s Grade 8 class from their bunks at Fort Wellington on the third day of Canada’s Coolest School Trip. Packing up with almost military efficiency, students piled onto the bus that would take them to Jones Falls, their first stop on the Rideau Canal. Nestled in forested hills, the Jones Falls lock station and the surrounding historic buildings offer postcard-perfect vistas. Don MacKay, a Parks Canada interpreter, welcomed the students to the site and talked about the Rideau Canal’s history. Designed by Lieutenant-Colonel John By, the canal boasts a series of 47 locks stretching from Kingston to Ottawa and was built using limestone and sandstone. The Jones Falls locks were completed in 1832. Students had the chance to walk around the site to explore what life would have been like in the early 1800s. MacKay, a modern-day blacksmith who has been practising his craft for 20 years, gave the class a demonstration in the forge that sits beside Jones Falls locks. As MacKay worked, he asked student volunteers to pump the bellows for him. Although an apprentice blacksmith would have lived and worked at a forge for five years while they learned their craft, students spent only a few minutes each sweating over the fire as MacKay welded an iron rod into a heart. The forge isn’t only for decoration but also doubles as a repair shop for the Rideau Canal locks and a gift shop. For a souvenir of her trip, Reece Belanger picked out a troll cross, a small piece of iron twisted into a loop with curled ends. Next, the class hiked uphill to the lockmaster’s house, where the first lockmaster Peter Sweeney lived with his family. The house was made to be defensible, with thick stone walls and small windows, and inside there was a heavy safe where Sweeney kept his valuables. The students had a lively discussion on the best way one could go about stealing a safe (such as rolling it down the hill). Afterwards, everyone came back down to the locks for a picnic lunch overlooking the tranquil waters of Whitefish Lake. Before leaving the site, students made one last hike up to see the Jones Falls Dam. It’s referred to as the “Great Stone Arch Dam” because, at the time of its completion in 1831, it was the highest dam in North America. Its other name, the “Whispering Dam,” comes from the way that sound travels along its curved wall. From Jones Falls, the class took the bus north to Beveridges locks, which links the Rideau Canal waterways to the town of Perth through the Tay Canal. Here, students set up tents and had a chance to get some real camping experience. There was a hike to visit the marshes of Tay River, and at the campsite, students were provided with fishing rods. With trees on all sides, the banks along the Tay Canal made for a quiet place to relax and enjoy the outdoors. Before long, it was time for dinner and everyone sat down at a long table for the barbeque. As per class tradition, students were chosen to say a few words of gratitude for the day. “I'm thankful for the chance we had to enter the competition and everyone that worked hard,” said Hunter Zamarripa. Finally, what camping experience would have been complete without a campfire? There was live guitar music from Christie Ulicny, a Toronto-based songwriter and musician, and plenty of marshmallows to go around. 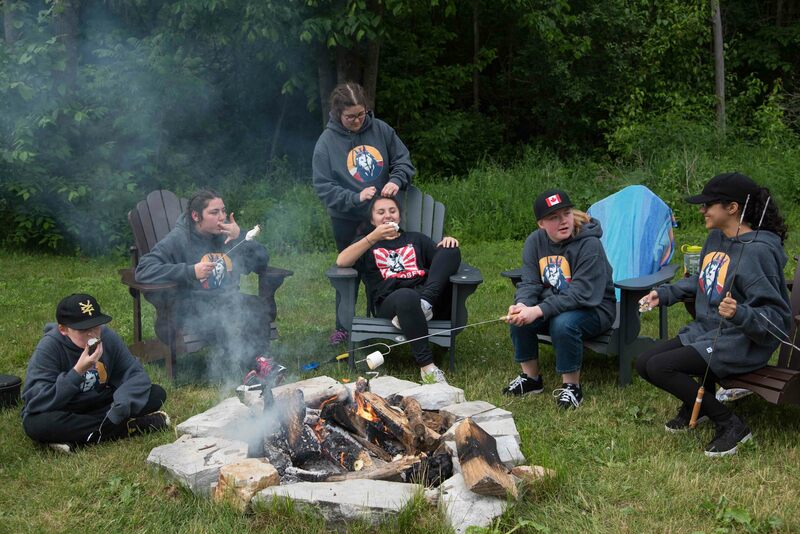 As the sun set over the water, the students held a rap battle and sang songs, and although “All Star” by Smash Mouth isn’t your conventional campfire song, they sang it with gusto. The students finally fell asleep to the calming sounds of loons calling out and the gurgling of water escaping through the locks. There’s just one day left of Canada’s Coolest School Trip so check back soon for the final highlights!